Although DUI checkpoints can really occur any time of year or day of the week, they’re particularly common on holidays and weekends. These tend to be the times when people are most likely hanging out and relaxing with friends and family – occasions which often include alcohol. As summer has quickly faded into fall, and winter will shortly follow, be aware that checkpoints often increase during Thanksgiving and the winter holidays. Between Thanksgiving Day and the few days after New Year’s, police patrols will likely be amped up, and if you’re imbibing in holiday celebrations that involve alcohol, you could be susceptible to a DUI if you arrive at a checkpoint. Do You Have to Stop if You Pull up to a DUI Checkpoint? People often ask if they’re required to stop when they pull up to a DUI checkpoint. In short, yes, you absolutely must stop if you find yourself at a checkpoint. DUI checkpoints are not quite the same as situations whereby individuals are pulled over while driving. In the latter situation, an officer must have reasonable suspicion of a crime prior to pull a driver over lawfully. DUI checkpoints, however, are considered “administrative inspections.” Because they are not targeting any one individual, but rather are intended to ensure overall public safety and deter drunk driving, DUI checkpoints do not violate a person’s constitutional rights. Related: How Much is Bail for a DUI in California? 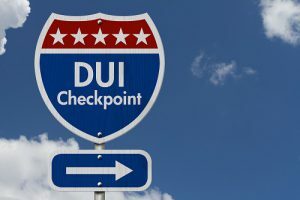 Are DUI Checkpoints Announced Ahead of Time in California? DUI checkpoints are, in fact, announced ahead of time. In 1990, checkpoints were challenged all the way up to the U.S. Supreme Court. The case argued that DUI checkpoints violate citizens’ Fourth Amendment rights against illegal search and seizure. The U.S. Supreme Court ruled that checkpoints do not violate Constitutional protections if the public is made aware of them ahead of time. Hopefully, you haven’t been drinking. If that’s the case, you shouldn’t have anything to worry about; however, DUI checkpoints can be unnerving for even the soberest of drivers. The most important thing to remember is to stay calm. Approach the checkpoint at a slow speed. If officers are directing traffic into more than one lane, obey the instructions of the officer when he or she gets to your car. Crack your window just enough to give the police officer your documents. It’s helpful to have your license, registration, and insurance available when he or she arrives at your window, but if your documents are far out of reach, you may want to wait until the officer requests the documents to dissuade any undue suspicion. Comply with the officers’ directions. They may ask you questions or require further information. In all cases, always be polite and respectful. If you refuse to provide documents, answer questions, or comply with the officers’ requests, you may open yourself up to further investigation beyond the bounds of a simple DUI checkpoint. Los Angeles DUI checkpoints come and go very quickly. The goal of the officers isn’t to keep you from where you’re trying to go; they’re simply trying to ensure the safety and well-being of the people on the road. If you comply with their requests, and aren’t drinking and driving, you’ll probably be on your way before you know it. If you get arrested at a DUI checkpoint, contact a DUI attorney as soon as you can. The quicker you have a lawyer on your side, investigating the events of the evening, the quicker your lawyer will be able to identify any missteps or situations that may be outside of the law. Be sure to drive safely this holiday season. Don’t give officers a reason to pull you over, and don’t give yourself any reason to be concerned, should you happen upon a DUI checkpoint unexpectedly.